Google Public Policy Blog: What policymakers should know about "cloud computing"
What policymakers should know about "cloud computing"
Most technology observers see "cloud computing" -- the movement of computer applications and data storage from the desktop to remote servers -- as the next big thing in computing. We held a "Google D.C. Talk " on the topic last September, and write quite a bit about cloud computing on this blog. But for many policymakers, the concept of cloud computing and its implications are still not well understood. To help clear through the confusion, Jeffrey Rayport and Andrew Heyward of the research firm Marketspace released a paper today based on a series of interviews with dozens of people from business, academia, and government. This paper is called “Envisioning the Cloud: the Next Computing Paradigm" and was commissioned by Google. 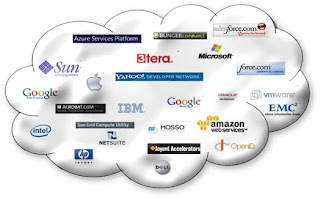 Full connectivity - Users have to be connected to the Internet for cloud-based services to flourish -- all users, all the time. Government can encourage availability and adoption of cloud computing through tax incentives to technology providers, subsidies to low-income users, and regulation of the wireless spectrum. Open access - Access to the basic infrastructure of cloud computing should not be based on discriminatory pricing or provide an unfair advantage to certain users. Congress can take the lead in clarifying openness rules for the marketplace and the FCC should actively enforce existing laws designed to ensure open access. Security - Cloud computing providers must make a compelling case to users that their data is safe. While competitive market forces will drive service providers to differentiate themselves on security, the government can play a role by aggressively enforcing cyber-crime laws. Privacy - Cloud computing providers must address three specific concerns about privacy: protecting data from unauthorized access by government; restricting its exploitation for commercial purposes; and safeguarding it from the prying eyes of competitors. One goal of privacy legislation should be to shield consumer data from inappropriate government scrutiny and to define what rights companies have to use data about their users for commercial purposes. It's always tempting to suggest that the next new technology will be disruptive, game-changing, or revolutionary. The Internet certainly was. It remains to be seen whether cloud computing will deliver the same magnitude of changes and benefits (or more), but it unquestionably holds a lot of promise. Cloud computing can be a great equalizer, putting powerful computing tools that were once available only to large institutions in the hands of individuals and small businesses. It can promote competition, accelerate innovation, enhance productivity, deliver cost savings, strengthen data security and maybe even help our environment. That is a lot to live up to, but we hope that by continuing this conversation we can separate hype from reality and offer some practical suggestions aimed at getting the most out of what cloud computing has to offer. I would add to the discussion on security and privacy, that companies need to ensure users that they can retain the rights to their data not the companies themselves. This has been a primary concern of the faculty at the university that I work for. Users need to know when they still own the data, or if they are giving up rights to their data by using the cloud computing service. It's not just about privacy and security, it's about data ownership too. While I can see considerable advantages to cloud computing, I cannot avoid concluding that individual intellectual freedom is generally strengthened when information cannot, even theoretically, be controlled or manipulated by one or more significant economic, social or political actors. Efficiency is not the only objective to retain firmly in our sights if we wish to construct a better future for individuals.